FREE choir taster session with Got 2 Sing! Try us for free!Try free! Book your FREE choir taster session! Simply complete the booking form for further information which will be sent to you by email. Please don’t worry if you’re coming by yourself – we have new members every week and you will be made to feel very welcome and meet like-minded, spirited, fabulous people! Click here to see when our choirs are open! Stourbridge, Bewdley, Worcester, Bromsgrove, Wolverhampton, Hereford, Cheltenham, Shrewsbury, Telford, Harborne and a Youth Choir in Stourbridge. Members do not need to audition or be able to read music as all teaching is done by ear. 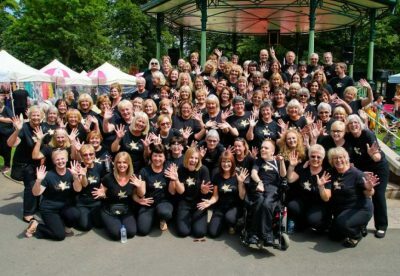 Singing uplifting hits of pop, rock and soul in beautiful three-part harmony, the choir is open to people of all abilities.